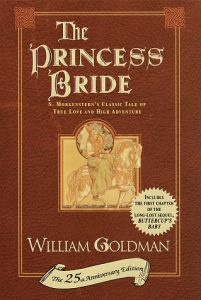 The Princess Bride is a fantasy novel written by William Goldman in 1973 as an abridgment which he calls “ the good parts” version of an older work by a Florinese author named S. Morgenstern. Goldman presents himself as the narrator and starts off the novel with an introduction and personal commentary of his childhood and his current life with his son and wife and most importantly how he came about writing the so called abridgement. The interesting thing that highlights Goldman’s genius is that Florin, Morgenstern, the original work and Goldman’s backstory are all fictional. The tale of the princess bride is set in the fictional land of Florin and centers upon the story of Buttercup, a girl who lives on a farm and who constantly teases the farm boy Westley and orders him around. Westley on the other hand obeys her every command because he truly loves her. Buttercup only realizes her love for Westley before he leaves to seek out his fortune and vanishes leaving her heartbroken. As the story goes on, Buttercup is betrothed to the superficial Prince of Florin and is kidnapped by three villains as a part of the Prince’s plot to seek out war with the Guilderians. The remainder of the story is packed with Buttercup’s attempts of escape, her reunion with Westley, her near suicide and an ending that is left solely up to the reader’s faith, optimism and commitment towards this love affair. Goldman admits that something about his successful novel touches its readers. That may be due to the uncomplicated plot of the fairytale-like novel that is packed with a love that defies all odds, action, adventure, revenge and surprisingly even comedy. Part of what makes the novel such a success is the fact that it is an easy read and the author gives the readers full control to use their imagination to make of the story what they will and immerses them in the action and suspense.